A black and white photograph of Whitby. 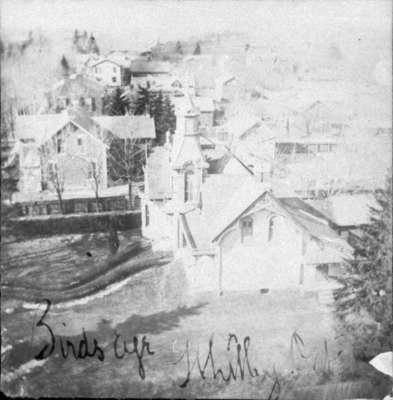 This view looks west from the steeple of All Saints' Anglican Church at the north west corner of Dundas Street and Centre Street. The house with the tower in the foregound was the residence of Dr. D.P. Bogart. It was built in 1877 and demolished in 1955. The house beyond it (at left) is the residence of J.J. Lynde. J.J. Lynde's home was located at the north east corner of Dundas Street and Kent Street. It was demolished in 1967. Dundas Street is at the far left of this photograph. Click on the links on the right side of the page to view the same image in 1964 and 2013. Top of Photo: Birds Eye, Whitby, Ont.